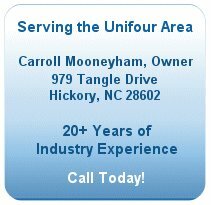 Serving the Unifour Area with 20+ Years of Pool Building Experience! Universal Pool, LLC specializes in high quality inground pool construction and serves the Unifour area. With over 20 years of experience in pool construction, we offer full-service, turn key pool solutions including hardscaping. We take pride in our pools and have earned the reputation of being a trustworthy and dependable pool builder. All work is completed and supervised directly by the Universal Pool builder -- no crews are ever left unsupervised to complete the work. The addition of a pool to your property is an investment and we treat it as such. We will help you decide which style of pool is best for you and explain the process completely. From start to finish, Universal Pool will take care of every step, professionally and efficiently. Feel free to browse our website to learn more about Universal Pool, LLC and what we have to offer. Be sure to visit our Gallery to view some of the pools that are available to you. If you have questions or would like more information, please contact us. We are the source for swimming pools in Hickory, NC, as well as Newton, Conover, Lenoir, Morganton, Mooresville, Lake Norman and the surrounding area. If you're searching for "Swimming Pools Hickory NC", Universal Pools LLC can help you build the swimming pool of your dreams!